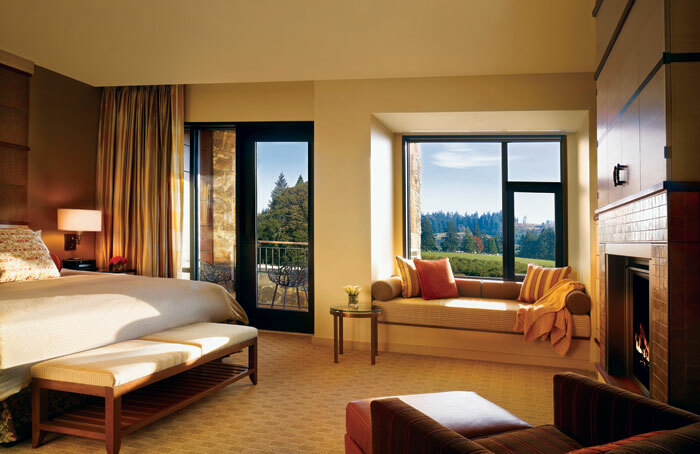 When The Allison Inn & Spa opened in September 2009, it offered many firsts in Willamette Valley’s wine country: fireplaces, balconies, and jet tubs in every deluxe room; LEED -certified construction; a vineyard-to-table wine selection in the signature restaurant; and cutting edge treatments in the salon and spa. The extensive property is primed for destination weddings, but is also an attainable escape set in rolling hills less than an hour from Portland. Consider booking as early as you can, though, since The Allison will be hosting at most only one wedding per weekend. That’s because once each couple and their guests arrive, they’ll feel like the resort was built just for their occasion. Options include a catered rehearsal in the working vineyard (Allison Pinot noir coming in 2011! ), a day of pampering in the private spa suite (complete with tranquil patio), golf at nearby award-winning Chehalem Glenn, a ceremony in the secluded Meadow or on the terraced Estate Garden, and a gala reception in the light-filled ballroom. The best part? The Willamette Valley finally has a fabulous, world-class hotel to go with its fabulous, world-class wines. The seven wooded acres in Monroe that make up new reception site Paradise Springs have been in the Nystrom family since the early 1950s. Brides, add another thank you note to your list.